Mumbai: While education for the city’s underprivileged children is of utmost importance, it is equally exigent that they get regular, nutritious meals. 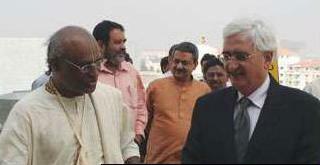 "The monumental Cultural Complex was inaugurated in 1997 by the then President of India Dr. Shankar Dayal Sharma. " Recognising this, The Akshaya Patra Foundation (TAPF), a Bangalore-based NGO that operates the world’s largest privately run midday meal programme, is planning to set up a centralised kitchen in the city. It will cater to the city’s state-run schools, as well as to NGOs conducting child education programmes. “What is the use of education when a child goes hungry and cannot concentrate in class?” said Madhu Pandit Dasa, chairman of the NGO, which feeds more than a million children at 17 locations in seven states. “I have come across families who have sold their children’s books so that they can buy a day’s meal,” he added. The NGO is backed by leading IT firms such as Cisco and Mindtree, high-profile individuals and also common citizens. Sudha Murthy, wife of Infosys chairman Narayan Murthy, is one of the donors. Murthy said, “When I visited their Bangalore centre, I was pleased to see that the kitchen has really good hygienic standards. The NGO’s entry into the city has its share of hurdles. The foundation had been invited twice by the then-CM Vilasrao Deshmukh to set up a centre in Mumbai, but since it was then quite small, the project was not feasible. The NGO also at the short end of Mumbai’s exorbitant property rates, as it needs a large centrally-located kitchen to reach out to all parts of the city.